Hello again, friends! 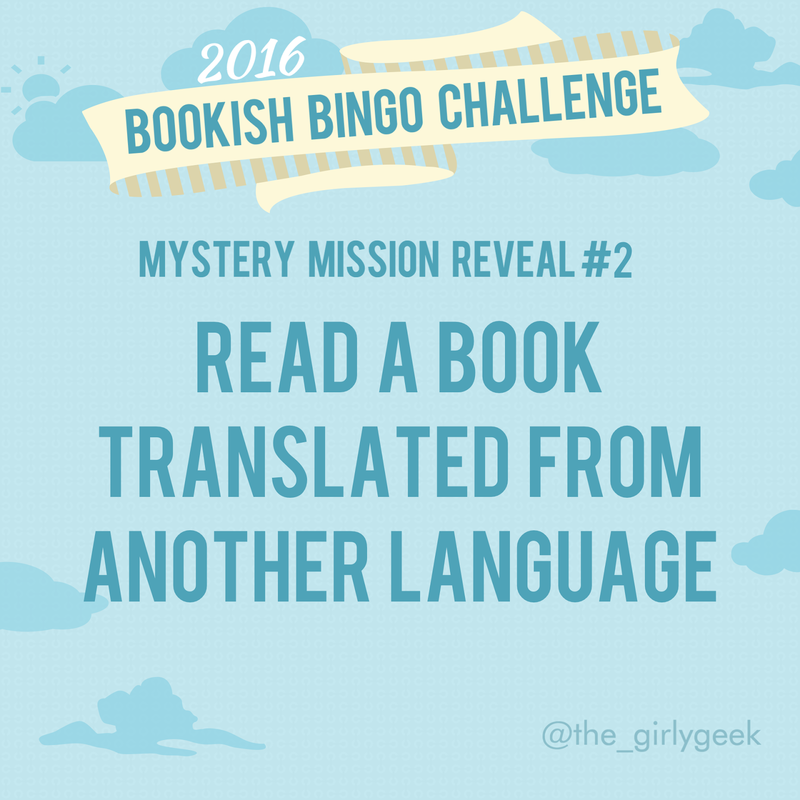 The time has come (once again) for me to reveal the latest Mystery Mission of the 2016 Bookish Bingo Challenge. In case you missed the first reveal, you can see that one here. So, you wanna see it? WOOOO! So yes, this challenge is to read a book translated from another language. This challenge is actually reminiscent of one that was included in last year's card, but I never got to complete it myself either. Also, shout out to the user 'writer..' in the GoodReads group who suggested a similar concept that reminded me of this! Whether it is a book translated to English, or you're reading something Translated from English to learn a new language, it counts! I think this mission is by far one of my favourite concepts. After all, reading is largely centred on a love of language. It's always fascinated me that through hundreds of differing languages a single story can be conveyed to thousands of people. I really do believe that stories and the emotions they express are universal, so it'd be really interesting to witness it in action. I'm not sure if I've read any books of this category in the past, but I'm thrilled to get to do so in the future. I think for my book I'm going to go with Ruby Red by Kiersten Gier, which was originally written in German. What do you think about this challenge? What will you be reading? P.S. yes, I'm still on hiatus for now! At this point in time I'm not sure when I'll be able to resume blogging regularly, but I'm optimistic!